With its graceful crown and central fire, it's no wonder so many people fall in love with Tipis. 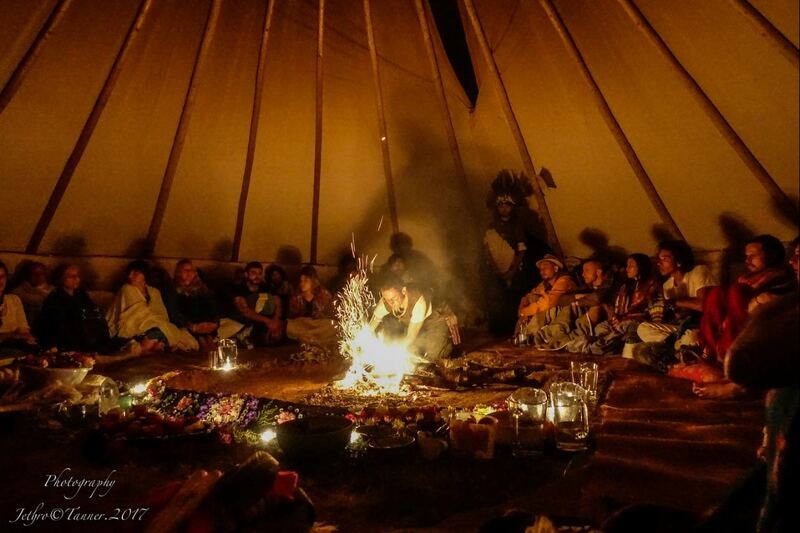 To spend time in a Tipi is to return to a simpler, more elemental way of living on the earth. Tipis are extremely stable in strong winds with steep sides to shed heavy rain. They are well ventilated and versatile. In warm weather the sides can be rolled up and opened to create a graceful merging with the exterior space. One aspect never to be forgotten is the internal fire and hearth that is the heart and spirit of the Tipi, from which we take our name. Our Tipis combine traditional tribal designs with practicality. 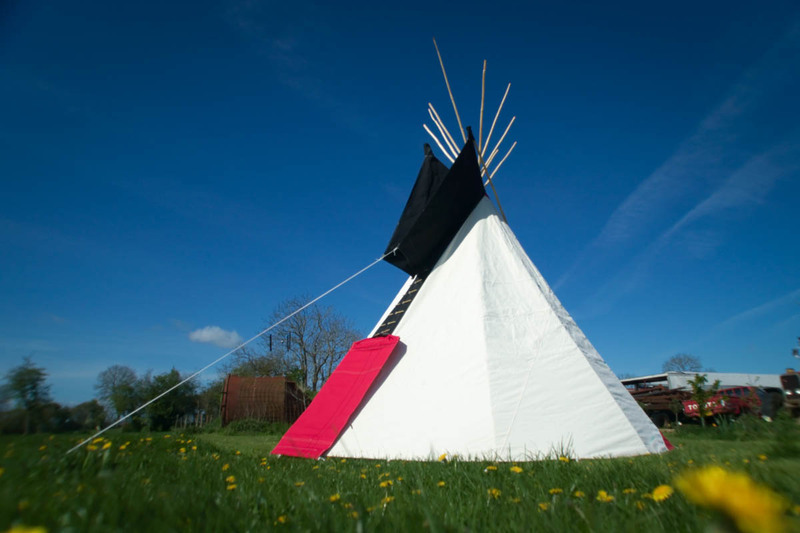 We have been manufacturing traditional Tipis since 1999 and offer rigorously high standards of stitching and canvas work, using the best quality materials available to us in the UK. Our design was originally based on the popularized Sioux Tipi pattern. Over the years we have added our own refinements to reinforce and improve the traditional designs, making them more durable to the rigors of countless installations and more ideally suited to the conditions of the British climate. Hearthworks Tipis are made from heavy duty 12oz/yd2 Polycotton Canvas treated against water, rot and fire, with reinforced peg loops and lacing pin holes. The canvas is generally natural cotton colour although we also offer a variety of coloured canvas trim. An extra strip has been added behind the lacing pin section to catch any drips that find their way through the pin holes, and thus making the design more weatherproof. We equip our Tipis with Inner Liners that are essential for Tipi living. The Liner is a secondary piece of Canvas that hangs around the inside of the Tipi about 5ft off the ground. Adding this second layer gives insulation, ventilation and helps with the draw of the smoke from the central fire. Tipi Inner Liners also have a PVC bottom section to protect against ground damp. 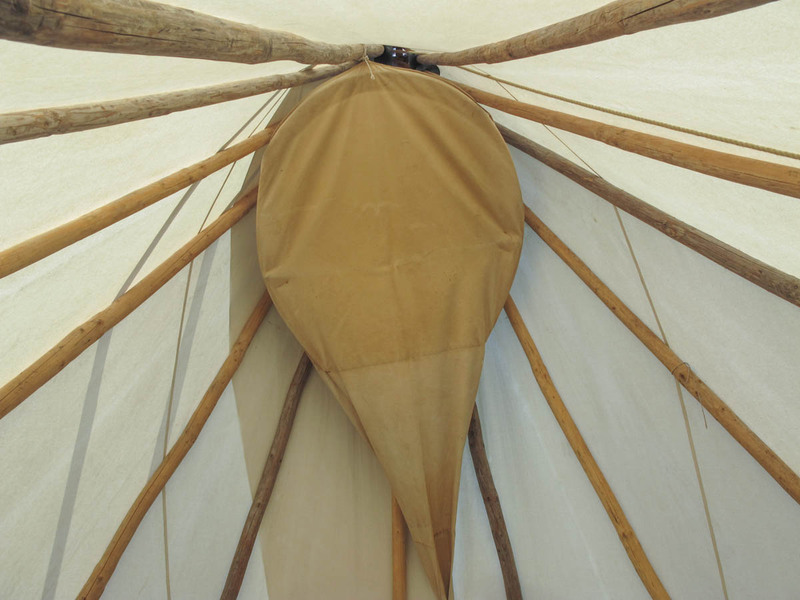 Another Hearthworks innovation to ensure you stay warm and dry in your lodge is the ‘Rain-catcher’ - a tear-drop shaped piece of canvas that hangs inside the Tipi and channels any drips outside the Tipi. Hearthworks were the first Tipi manufacturers to start using rain-catchers in the UK. An alternative to the Rain-catcher is a UK design innovation known as the ‘Rain-hat’ - a large square of canvas often attached to a long external pole and then placed over the crown of the Tipi. This prevents the rain from entering the lodge, making for a dry interior, but at the cost of losing some of the simple beauty of the classic Tipi shape. We tend to recommend using Rain-catchers in larger Tipis or for Tipis that still want the traditional aesthetic, and using Rain-hats for smaller Tipis and where complete weather protection is paramount. We manufacture Tipis from 9 to 30 ft in diameter. For the larger sizes above 25’ diameter we offer the Sunlodge design, a wider Tipi with a lower pitch, a design that allows a larger footprint with the same length poles. Often the main body of the Tipi is in natural white canvas that lets in a good quality of natural daylight. Also popular is to have the main body of the canvas in Light Sand – which looks good for longer! 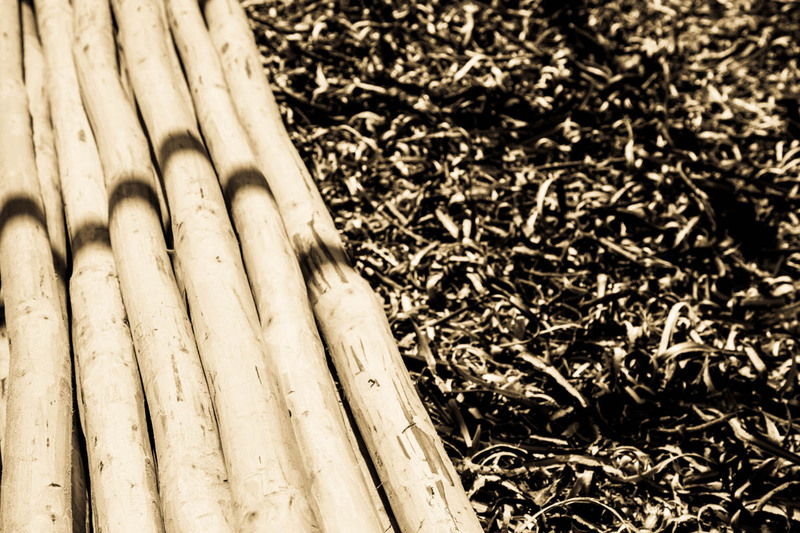 Tipi poles are selected from local sustainable pine forests of Spruce or Douglas Fir. The poles are cut to size depending on the size of the Tipi and hand stripped with a drawknife and then finished with a sander, for a smooth final surface . Each Tipi comes complete with Pine lacing pins, local hand cleft Ash pegs and Polyhemp rope. Our standard Tipi package consists of a set of wooden Poles, the main Tipi canvas, a canvas door with door laths, a Rain-catcher or Rain-hat, and an inner liner as well as a heavy-duty Groundsheet and all the required fixings and fasteners such as rope, pegs and lacing pins.